Have you tried AirConsole? Its motto is "Your browser is the console, your smartphone is the gamepad," which means exactly what you think it does. You can play games on your PC screen, controlling them with your phone, which turns into a touch controller. You can invite your friends for multiplayer games too! 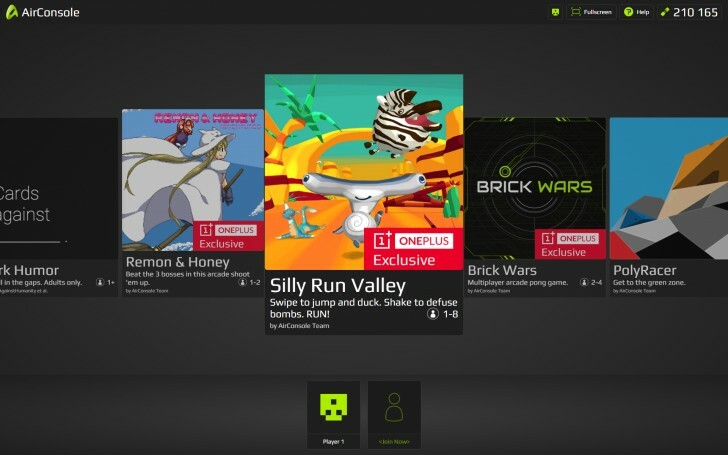 Now OnePlus has partnered with AirConsole to offer some exclusive games for the platform – Silly Run Valley, Remon & Honey and Brick Wars. Update:To get the exclusive titles, you would need to open the AirConsole website from the OnePlus promo landing page. If you go directly to the AirConsile website, you won't get access to the exclusive titles. We slacked off work for a few minutes to try out the games and they are very impressive, multiplayer is especially fun. Silly Run Valley is an infinite runner in the vein of Temple Run and works with the phone's accelerometer. Remon & Honey is a side-scrolling shoot-'em-up, which puts an old-school controller on your phone. Multitouch is supported, so pressing several buttons at once works (but don't hold down the fire all the time or your weapon will "overheat"). There are other games too, suitable for a more mature audience like Texas Hold 'em and Cards Against Humanity. Note that you don't have to install anything – just open www.airconsole.com on both a computer and a phone (or several) and type in the provided code. You can also install the AirConsole game if you're going to play often, but the browser-only version is great for an impromptu party game challenge. PS. We can't try it right now (work and what not), but apparently AirConsole works with Smart TV browsers too, so you don't even need a PC.